When it comes to Star Wars, two characters come to mind as the best sidekicks in the galaxy: Chewbacca and R2-D2. While Chewy is a great companion to Han Solo, R2-D2 may very well be considered the best sidekick of all time. He helped Leia sneak away with the plans to the death star while Darth Vader was hot on their trail, he stuck around with C3-PO (for the most part) as they wandered through the deserts of Tatooine, and he’s performed as an admirable wing-man to Luke Skywalker. 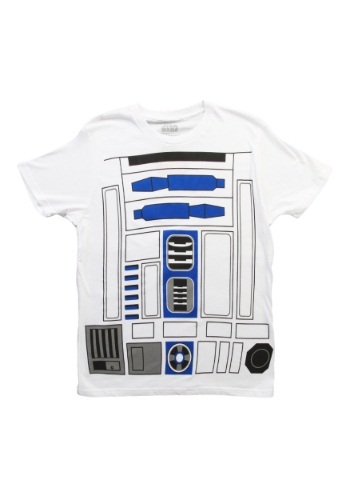 If you deem yourself as a worthy companion, you should totally get yourself this R2-D2 costume t-shirt. This men’s R2-D2 costume t-shirt will have you looking like everyone’s favorite droid. The white shirts feature the droid’s iconic look on the front, but they’re 100% cotton so you don’t have to worry about a clunky metal exterior. Wearing this shirt will also allow you communicate using a sophisticated variety of beeps, boops, and whistles (hopefully, people will understand the context of what you’re trying to say). With this R2-D2 costume t-shirt, you'll certainly become the droid your friends are looking for. Great shirt and true to size. Words can not describe everything...tout simplement incroyable...f**king great!! !